Background and Aim: Regular use of a potent antiplaque compound, especially formulated in toothpaste, can be beneficial in dental plaque control. Many herbal toothpastes are claiming to have anticariogenic property but they are not evident and not substantiated by the dental professionals. It is important that clinical trials should verify the efficacy of any new product, instead of simply accepting them. Hence, the present work was designed to evaluate and compare the antibacterial activity of commercially available herbal toothpastes against the clinically isolated human Streptococcus mutans. 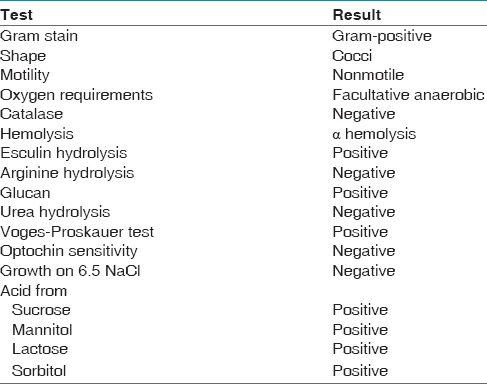 Materials and Methods: The known clinical samples from caries-positive patients were collected, and S. mutans bacteria was isolated and identified by morphology, biochemical profiling, and 16s rDNA sequencing method. The antibacterial efficacy of six herbal toothpastes against S. mutans clinical isolate was evaluated by standard agar well diffusion method. Results: Danthakanthi, among all the tested toothpastes, was found to be more effective with zone of inhibition 27.50 ± 0.51 mm, compared to standard and other tested pastes followed by Miswak and Colgate herbal. Vicco was found to be least effective with zone of inhibition 18.90 ± 0.18 mm against the tested bacteria. Conclusion: Herbal toothpastes have the prospect of becoming safer and effective alternative and provide an ideal home care anticariogenic regime. Toothpaste with multiple herbal ingredients is more efficient than the toothpastes with fewer herbal ingredients in an anticariogenic property. Dental caries is the most common form of a multifactorial oral disease known to man, characterized by demineralization of the inorganic portion and destruction of organic substance of the tooth which often leads to cavitations. The Latin meaning of caries is rot or decay. The burden of dental caries is still a major health problem in most industrialized countries as it affects 60%–90% of school aged children and the vast majority of adult. This is largely due to the increasing consumption of sugar and inadequate exposure to fluorides. Many of the factors such as socioeconomic, sociobehavioral, environmental, poor education, unemployment, and low social classes have greater impact on dental caries prevalence. Although dental caries is the multifactorial disease, high counts of cariogenic bacteria are one of the principle etiological factors for the disease initiation and development. Streptococcus mutans is the most commonly isolated bacteria from human dental plaque. Cariogenic potential of S. mutans due to its virulence factors mainly adhesion capacity, acidogenicity, and aciduricity. Oral bacteria are likely to spend majority of their natural existence growing as a biofilm. Dental biofilm can be divided into fissure, smooth surface, approximal, supragingival, and subgingival based on its location. As biofilm formation is a natural process in the oral environment, it is necessary to remove the plaque regularly to prevent the development of caries and periodontal diseases. Both chemical and mechanical measures are used for the removal of plaque and to maintain oral hygiene. The most inexpensive and effective method is toothbrushing. In many cases with higher risk of disease, brushing alone could not serve the purpose. Therefore, nowadays, new antimicrobials are being introduced into the toothpastes to increase their effectiveness. In the modern world, people are more conscious about the ill effects of the chemical and synthetic products as well as the benefits of the natural products. The herbal products in health care have drawn the attention in the market. There are several toothpastes available in market that claim to be anticariogenic due to the presence of several active constituents. Many herbal toothpastes are claiming to have anticariogenic property but they are not evident and not substantiated by the dental professionals. Hence, the present work was designed to evaluate and compare the antibacterial activity of commercially available herbal toothpastes against the clinically isolated human S. mutans. The infected teeth samples from known dental caries patients were collected at the Department of Dentistry, District Government Mc Gann Hospital, Shivamogga, Karnataka. The samples were brought to laboratory in reduced transport fluid medium (0.4% agar, 0.15% thioglycollate/phosphate-buffered saline). The samples in the tubes were vortex mixed for a minute to allow the dispersion of bacteria into the medium. Then, 0.1 ml of undiluted inoculum was spread on mitis salivarius bacitracin (MSB, Hi Media, Mumbai) agar medium. The plates were incubated anaerobically at 37°C for 24–48 h. The positive samples with 104 cells/ml were considered for further identification. The colonies on MSB plates were subcultured on 5% sheep blood agar medium. After incubation for 24 h at 37°C, the colonies with alpha hemolysis were selected for further identification. Identification of the isolates was done using standard cultural, morphological, and biochemical characteristics as described in the Bergey's Manual of Determinative Bacteriology. Further identification was done by dextran production test, and confirmation of S. mutans was done by following the methodology described by gold. Molecular identification of the clinical isolate was done by 16s r DNA sequence analysis. The genomic DNA was isolated from overnight bacterial culture using genomic DNA isolation kit-RKN15 (Chromos Biotech Pvt. Ltd., India) according to the manufacturer's instructions. Amplification of DNA was performed in a thermal cycler (ABI-2720) with a recombinant Taq DNA polymerase. Sequencing reactions were carried out using ABI-3130 genetic analyzer with the reagents of “Big Dye Terminator version 3.1” Cycle sequencing kit (Chromos Biotech Pvt. Ltd., India). The data obtained were analyzed using specific analysis software, Seq Scape_v 5.2. The sequence data were aligned and analyzed to identify the bacterium and its closest neighbors. Six toothpaste brands, as shown in [Table 1], were brought from local market of Shivamogga, Karnataka. The dentifrices were carefully selected as all with date of manufacture within the last 6 months for the purpose of standardization. The antimicrobial activity of different concentrations of the dentifrices was determined by modified agar well diffusion method. Known amount of selected toothpastes was dissolved in sterile water to make various concentrations such as 100 mg/ml, 50 mg/ml, and 25 mg/ml. Distilled water was taken as negative control and 0.2% chlorhexidine was taken as positive control. Mueller Hinton agar (Hi Media) plates were seeded with 24-h old broth culture of isolated S. mutans. The plates were allowed to dry for few minutes. A sterile 6 mm cork borer was used to cut 5 equidistance wells in each plate. About 100 μl of respective concentration of each dentifrice were loaded into the labeled wells. Same amount of sterile distilled water was used as control and 0.12% chlorhexidine as positive standard. The plates were incubated at 37°C for 24 h in upright position. The experiment was carried out in triplicate, and the zone of inhibition was recorded. The efficacy of the dentifrices against S. mutans was calculated according to inhibition zone in terms of mm. Antimicrobial activities were carried out three times for each parameter of dentifrices. Hence, obtained three replicates (n = 3) from which the mean and standard error were analyzed using IBM SPSS statistics 21 software, IBM Corporation, US, 2012. P < 0.05 was considered as statistically significant. Colonies on MSB agar were small, opaque, pale blue in color with frosted glass-like appearance. On 5% sheep blood agar, the greenish discoloration around the colonies was noticed, and the same colonies were devoid of β and γ hemolytic colonies authenticating the isolates. Gram-positive cocci in chains were noticed. The biochemical reactions of the isolates were carried out to reconfirm the isolates as S. mutans [Table 2]. The clinical isolate was further reconfirmed by 16s rDNA sequence analysis. The gene coding for 16s r DNA was found to be 1422 bp. Sequence was subjected to n basic local alignment search tool (BLAST) search analysis present in the Gene Bank using BLAST. On the basis of BLAST search, the top ten S. mutans species showing 99% homology were selected, and phylogenetic tree was constructed. The 16s rRNA sequences of clinical isolate S. mutans have been deposited in the gene bank database, NCBI under the accession number KU936829, GI: 1032922888 as S. mutans strain BNM13. 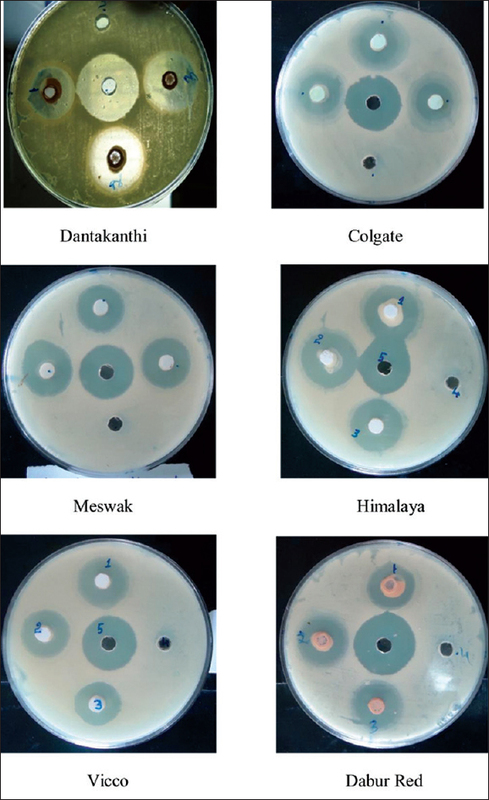 All the six dentifrices demonstrated various level of antimicrobial activity against tested isolate S. mutans strain BNM13 [Figure 1]. Among all the tested toothpastes, Dantakanthi was found to be more effective with zone of inhibition 27.50 ± 0.51 mm, compared to standard and other tested pastes. The potency of the Danthakanthi paste was highest at 1:1 dilution and found to be dose dependent. Miswak was found to exhibit good antibacterial activity against S. mutans. Colgate herbal paste was found next in its antibacterial activity, but there were no much variations in its activity with concentration. Among all the tested dentifrices, vicco was found to be least effective[Table 3]. Microorganisms are continuously trying to inhabit humans or any animals. Because the body, or a section of it, is nutrient rich comparatively stable with relation to water content, oxygen availability and temperature. Biofilm typically created of clusters of bacterial cells irreversibly hooked up to a surface and embedded in a very autogenous exopolymeric matrix. Dental plaque was one of the first biofilm discovered when Antoine Van Leeuwenhoek first used his primitive microscope to look at material he collected from his teeth crevices in 1683. Biofilm are resistant to physical forces such as the shear forces produced by blood flow and the washing action of saliva as well as to phagocytosis. Oral bacteria likely spend the majority of their natural existence growing as a biofilm. In the present study, S. mutans was employed as it is the principle etiological agent of dental caries. Once primary colonizers established, they invite secondary colonizers with series of changes in microenvironment finally leads to cavitations. Hence, it is very essential to maintain the oral hygiene as well as one should be more conscious in selection of dentifrices. Antibacterial efficacy of dentifrices is one of the key factors in selection of the toothpaste. The bioactive compounds present in the toothpastes inhibit the bacteria by disrupting their cell walls and inhibiting their enzymatic activity and reduce their colonization on the tooth surface. The majority of the toothpastes recommended by WHO, ADA, and FDI contains fluoride and triclosan. The excess use of the fluoride can cause the dental fluorosis and the effectiveness of fluoride toothpastes as an antimicrobial agent is concentration dependent. Using natural medicines to cure various diseases has become an increasing trend. Herbal medicine has made significant contribution to modern medical practice. In the market large numbers of herbal toothpastes are available; all claim for their effectiveness. It is important to verify the efficacy of any new product by clinical or in vitro trials, instead of simply assuming that the product is efficient based on manufactures' claims. Hence, the present work was aimed to evaluate the effectiveness of herbal toothpastes from selective brands against S. mutans. Most of the studies have compared the efficacy of herbal-based toothpaste against conventional toothpaste., In the present study, we compared anticariogenic potential of six herbal-based toothpastes. Studies proved that there is no significant difference in the efficacy of herbal and conventional toothpastes in their anticariogenic property. It is wise to opt for herbal toothpaste rather than conventional toothpaste containing harsh chemicals. In the present study, it was observed that all the tested toothpastes showed inhibitory activity against the cariogenic bacteria, S. mutans. The antimicrobial activity of the herbs is due to the presence of secondary metabolites such as alkaloids, flavonoids, polyphenols, and lectins. Among all the tested toothpastes, Dantakanthi (DK) was found to be more effective compared to other toothpaste and this is also evidenced by one of the previous reports. Dentifrice with fewer herbal ingredients had deprived inhibitory effects against cariogenic bacteria compared to ones with combination of herbs, which is evidenced by our observations as dentifrice with combination of herbs had better effect in inhibiting cariogenic bacteria compared to the ones with fewer herbal ingredients. Miswak mainly having the only one active ingredient (miswak extract) found less effective compared to Dantakanthi composed of combination of extracts. Although Miswak extract, alone or in combination with toothpaste, can affect the growth of dental plaque bacteria, it exhibits antifungal activity against Candida albicans. Shaheen et al. demonstrated that Dabur Miswak was found significantly less effective against the specific oral microflora as compared to other tested herbal dentifrices Danthkanthi, Dabur Red, Vicco Sugar Free, Vicco, Himalaya Herbals, Colgate Herb, and Neem. Surprisingly, Dabur red and Vicco were found less effective against S. mutans compared to Dantakanthi even though all the ingredients were almost the same. This variation may be because of (1) solvent of extraction and solvent concentration may be different, (2) concentration of the active compound in the crude extract may be different, (3) and there might be inhibition of active compound by other ingredients. However, all the dentifrices were found to contain crude plant extracts but the active compound responsible for the activity was unknown. Synergistic interactions between the principal components of these herbs are considered to be a vital part of their efficacy. S. mutans was found to be the most predominant bacteria in human dental plaque individuals. Herbal toothpastes significantly inhibit the S. mutans and were found to be promising anticariogenic agents, and Danthakanthi toothpaste was found to be effective among all the tested dentifrices. Herbal toothpastes have the prospect of becoming safer and effective alternative and provide an ideal home care anticariogenic regime. These traditional methods offer other claims also which are of great benefit for health. Exploring and harvesting these herbal products and blending the same with the advances may make oral and health care better. Further research is required to elucidate the mechanistic details of antibacterial activity numerous dentifrices in conjunction with additional comprehensive pharmacological investigations and are required to evaluate their toxicity and clinical efficacy for potential applications in the prevention and treatment of dental caries. Although many of the plant extracts and phytomedicines are proved to be efficient in dentistry till date, future studies should consider the safety and possible side effects of the products. Costa SM, Martins CC, Bonfim Mde L, Zina LG, Paiva SM, Pordeus IA, et al. Asystematic review of socioeconomic indicators and dental caries in adults. Int J Environ Res Public Health 2012;9:3540-74. Marsch PD, Martin MV. Oral Microbiology. 4th ed. Oxford: Wright; 1999. Friedrich J. The genus Streptococcus and dental disease. In: Mortimer PS, editors. Procaryotes Hand Book of Habitats, Isolation and Identification of Bacteria. Berlin, New York: Springer International Publishing AG; 1981. p. 1598-613. Essam FA, Hashim MZ, Faries AA. Isolation and identification of Streptococcus mutans (H5) produced glucosyltransferase and cell-assosited glucosyltransferase isolated from dental caries. Int J Curr Microbiol App Sci 2014;3:850-64. Gold OG, Jordan HV, Van Houte J. A selective medium for Streptococcus mutans. Arch Oral Biol 1973;18:1357-64. Bhargavi P, Mallikarjun N, Nagaraj K, Venugopal TM, Somasundar K. Biochemical analysis and 16S ribosomal RNA sequence-based identification of Streptococcus mutans from clinical isolates of dental caries: A phenotypic and genotypic identification. Indian J Oral Sci. [In press]. Vacca-Smith AM, Bowen WH. Effect of some antiplaque agents on the activity of glucosyltransferases of Streptococcus mutans adsorbed onto saliva-coated hydroxyapatite and in solution. Biofilm 1996;1:1-19. Nobbs AH, Lamont RJ, Jenkinson HF. Streptococcus adherence and colonization. Microbiol Mol Biol Rev 2009;73:407-50. Lewis K. Riddle of biofilm resistance. Antimicrob Agents Chemother 2001;45:999-1007. Amitava B, Abhirup G, Gautam KK, Biswajit G. Antimicrobial efficacy of few commercially available herbal and non herbal tooth pastes against clinically isolated human cariogenic pathogens. J Nepal Dent Assoc 2014;14:35-40. Prasanth M. Antimicrobial efficacy of different toothpastes and mouthrinses: An in vitro study. Dent Res J (Isfahan) 2011;8:85-94. Bou-Chacra NA, Gobi SS, Ohara MT, Pinto TJ. Antimicrobial activity of four different dental gel formulas on cariogenic bacteria evaluated using the linear regression method. Rev Bras Cienc Farm 2005;4:323-31. Almas K, Dahlan A, Mahmoud A. Propolis as a natural remedy: An update. Saudi Dent Soc 2001;13:45-9. Mullally BH, James JA, Coulter WA, Linden GJ. The efficacy of a herbal-based toothpaste on the control of plaque and gingivitis. J Clin Periodontol 1995;22:686-9. Ozaki F, Pannuti CM, Imbronito AV, Pessotti W, Saraiva L, de Freitas NM, et al. Efficacy of a herbal toothpaste on patients with established gingivitis – A randomized controlled trial. Braz Oral Res 2006;20:172-7. Sudha P, Karthik V, Anantharaj A, Shankargouda P. Comparison of two commercially available toothpastes on the salivary Streptococcus mutans count in urban preschool children – An in vivo study. Int Dent 2010;12:72-82. Fatima S, Farooqi AH, Kumar R, Khanuja SP. Antibacterial activity possessed by medicinal plants used in tooth powder. Arom Pl Sci 2000;22:187-9. Shaheen SS, Reddy P, Hemalatha, Reddy S, Doshi D, Kulkarni S, et al. Antimicrobial efficacy of ten commercially available herbal dentifrices against specific oral microflora –In vitro study. J Clin Diagn Res 2015;9:ZC42-6. Poureslami HR, Makarem A, Mojab F. Para clinical effects of miswak extract on dental plaque. Dent Res J 2007;4:106-10. Adwan G, Salameh Y, Adwan K, Barakat A. Assessment of antifungal activity of herbal and conventional toothpastes against clinical isolates of Candida albicans. Asian Pac J Trop Biomed 2012;2:375-9.